Fierce rip tide. Sean Spicer resigns, GS alumnus and hedge funder Scaramucci, “the SEC should stop demonizing WS” is offered the job. Priebus called a private meeting of the White House communications staff, and made clear that Spicer, who is expected to help Scaramucci transition into the role, is leaving to give the new communications director “a clean slate,” according to someone briefed on the meeting. Priebus also tried to play down any tensions with Scaramucci, saying the two have known each other for a long time, and Scaramucci told his new team that he is not a “top down” manager, this person said. Fake team spirit is revolting. Just shake hands and go, Spicey. A hug. Isn’t that special. More theater of the absurd. The chaos in the White House comms function would be important if Trump himself were not the principal cause of the chaos. No amount of wordsmithing and attempted intimidation by the WH spokespeople can alter that. Scaramucci’s first appearance as WH comms director suggests that he has the talent to be a a very skilled liar. Either that or he does not mean what I think he means when he says that Donald Trump has “very good karma”. His claim that Donald is “a very effective communicator” falls into the same bucket. Or, it could all be the “distraction du jour” for whatever is going on behind the scenes, like a Mueller firing or slew of preemptive pardons. Let’s also not forget our GOP Senators are not fully finished with the BCRA ram-through, so I’m sure this is something that will help cloak what McConnell’s up to. I was amused that Cornyn said that knowing what was in the bill was a luxury we couldn’t have (so to speak). Melissa McCarthy will need something else to do on Saturday night, however. Ok, so about a week ago I decided to keep track of the things that make me laugh out loud when I’m trying to keep ahead of the tsunami [h/t Rayne]. It might be a real belly laugh, or a sarcastic laugh, or a nervous laugh… Looking back at the week-that-was, some of the LOL’s strike me somewhat differently. Scaramucci says he’s seen Trump throw a spiral through a tire… for some reason. Rayne, that’s a great Trumpnami visual [banner?] on the front page! LOL Thanks! Imagine what I could have done if I’d had the right tools and proper training. 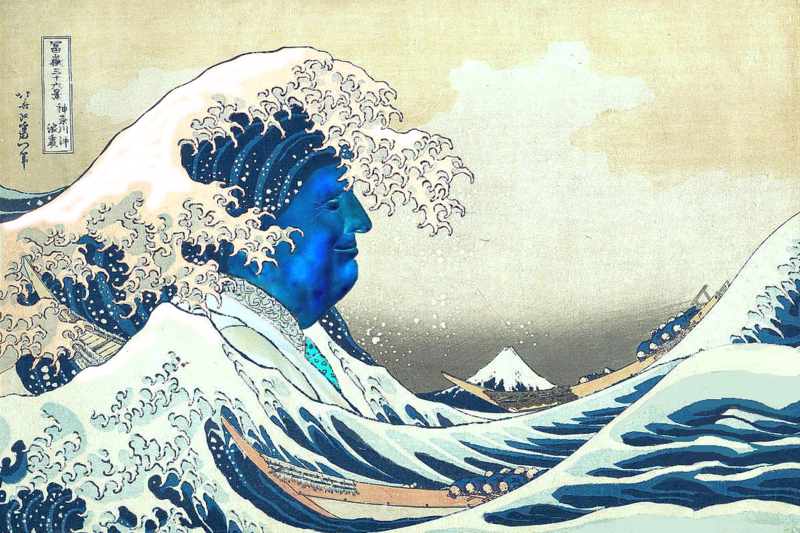 Sadly, I modded one of my favorite paintings for that; I’ve always loved the Great Wave at Kanagawa by Hokusai. But there’s really no other substitute for the shape of that wave. Wish the front page gallery showed the entire pic but it is what it is. In all Fairness, White House Press Briefings should be a thing of The Past. It’s Propaganda recorded by what is tantamount to Glorified Stenographers. There is nothing valuable to be gleaned from that. The more notable & effective Press Secretaries make it appear as though they’ve said something of substance when actually they’ve said, and revealed, nothing at all. Remember, this is FUN for Donald Trump. He was Positively Giddy when he did The NYT interview. I know The Three Musketeers at The NYT thought they were manipulating him but it was Trump who was manipulating them. More than Six Months In and a Mountain of Insanity and Trump is still Walking Tall. The Establishment’s Apoplexy is Wearing Thin. Trump is wearing The Establishment out. Look at Mika and Erin. They have what can only be described as PTSD — Post Trump Stress Disorder and yet we’re not Post Trump yet, if ever at this rate. For manipulation to be effective it has to have a purpose and it needs to be a necessary element to achieve that goal. The ongoing sap opera (intended) may distract, but I do not see how it benefits POTUS personally to do what he did here. All of this interview is basically tweet-bait and tweeting would be just as effective in distracting from what McConnell’s doing. His purpose and goal is LOOK AT ME EVERYONE. He likes to be The Center of Attention even if that Attention is considered by The Establishment to be negative. For him, Attention is Attention either way. Why else do you think he would have done The NYT interview when he knows full well The NYT hates his guts and wants to make Mince Meat out of him? Because he wants the Attention, good or bad. Remember, he believes he’s Teflon, and at this rate, he may be right. He’s been Teflon his entire life so far so why should he stop believing it now? Bloomberg even said he believes Donald Trump will win reelection in 2020. Maybe The Mainstream Media could try giving him no Attention whatsoever and only focus on the other two branches of Government. If The MSM was principled and strategic and serious, that’s what it would do, but of course, it has Owners & Sponsors and The Donald Trump Show is great for Media Revenue & Profits, so they’ll continue to Twist Themselves in Knots over him and play right into His Tiny Hands. Trump actually has long had a extremely good relationship with the lead reporter Maggie Haberman. Not sure why, but it is the case. That he talked to her yet again, is not surprising in the lest. Scaramucci said he loves the president. He said it several times. He said that Donaldo has done “an incredible job” for the American people. Perhaps the script sounded more credible in the original Russian. I think the CNN commentator had it right in explaining this choice as all about optics: the well-suited and coiffed Harvard Law School trained, ex-Goldman Sachs and now former investment banker Scaramucci is the guy Trump imagines he sees when he looks in the mirror (when it doesn’t crack). More mud wrestling ahead. by the way, Scaramouche is trying to sell hi company, Skybridge, to the Chinese. One of Priebus’ objections to him was that the optics looked absolutely horrible because the Chinese are now buying influence into the White House as well. Give Priebus a pinch of credit here, he is right. For all of his ineffectiveness as CoS, Priebus does understand political optics very well. That’s why no one is listening to him. The Little Skirmisher (what Scaramucci means in Italian). Finally, a Press Secretary who can do The Fandango. Thunderbolt & Lightning — very very Frightening!! When Spicey claimed he resigned, was that a violation of his loyalty oath? Unless the Russians were setting up Jr. as even more blackmailable leverage on Trump? Honestly, RU would probably go for both. Kompromat and collusion. Yes, but I’m speaking to the reason for the meeting in particular. The emails and meeting itself are enough to create Kompromat and make sense as such. It does not make as much sense that they would use that format to actually make a deal — if a deal, such as a quid-pro-quo, was ever established. As far as theories go, though, there are plenty to choose from. It’s interesting to speculate and read others views on this site. But, the “intelligence soft pitch designed to gauge receptivity” theory put forth by Mowatt-Larsen doesn’t make sense to me. Last year attorneys for the software maker quietly sued the hacker group known as Fancy Bear in a federal court outside Washington DC, accusing it of computer intrusion, cybersquatting, and infringing on Microsoft’s trademarks. The action, though, is not about dragging the hackers into court. The lawsuit is a tool for Microsoft to target what it calls “the most vulnerable point” in Fancy Bear’s espionage operations: the command-and-control servers the hackers use to covertly direct malware on victim computers. but comment there is closed… so i’ll post it here. Absolutely fine. For some technical reasons that are boring, we do close off comments on posts after a set amount of time. So this is a fine place to continue anything from that post thread. I will say this, I had some initial questions about the Prevezon settlement, but the more I looked at it and talked to people in and about SDNY, the less I think there was any real problem. The press consistently yammers about $230 million being at issue, but that was the supposed amount of the initial fraud in Russia that Browder harps on. The action in SDNY was a civil forfeiture actual against certain real property and a limited amount of money in bank accounts. At best, the real value was somewhere in the vicinity of $14 million give or take (and much of it was in the form of extremely illiquid real property). Prevezon was extremely well financed and loaded for bear, and actually trying the case was going to be insanely expensive for the DOJ, and Prevezon had legitimate defenses. In short, after really looking into it, I think the settlement was just fine and made sense. And I can find no evidence whatsoever the decision was made by anybody but the line level attorneys and leadership in SDNY. Maybe some other facts come out to change that, but I sure can’t find them at this point. Upon inspection, it looks legit to me. Thanks for sharing here – I designated this an open thread just for this purpose given older posts comments shut down after a period of time. I took the liberty of tweaking the HuffPo link you shared as it included an ID number to track you and where it posted. WRT to the story itself, you can see why Fusion resisted testifying before the Senate committee. I can’t blame them; they’ll be asked to disclose information about clients, potentially burning all future business opportunities. It’s interesting how hard right-wingers have tried to paint Fusion as a liberal-favoring research firm; if forced to testify, will the truth about who first paid them for anti-Trump information come out, and what would happen if it turned out to be Jeb Bush and family? thanks for those details. things always look different when you go from “storyline” level to actual-factual, historical details. thanks. i am alarmed at the idea that huff post citation allows me to be tracked. or am i interpreting your comment in a paranoid manner. if the citation does allow tracking, what can i cut off of a cite to protect privacy? do all media cites do this? When posting a URL, truncate (delete) everything from the question mark (?) to the end of the URL. This includes removing the question mark. What SLF said about that particular site’s URLs. Not all sites use tracking like that; not all use the same kind of tracking in their URLs. Can’t hurt to watch the links you share more closely, though. I also avoid Facebook links altogether; they track you by cookies after you click on any FB link, very sticky. See continuing concern that some new Goebbels is writing Trump’s tweets with the crazy doublespeak and the in your face lies. Not just bots but real life actors still supporting Trump with “but the emails”. There had to be fake Clinton emails. What disturbs me is not whether Trump and his minders knew they were spamming fake news, ( cause that’s politics). What disturbs me is the legs the fake news has in the minds of people I otherwise have respect for. Putin’s and Bannon’s plans to destroy America are proceeding. No need to empower them. If not them then someone else. All is inevitable once the staggering layers of corruption are so much steeper than the angle of repose.